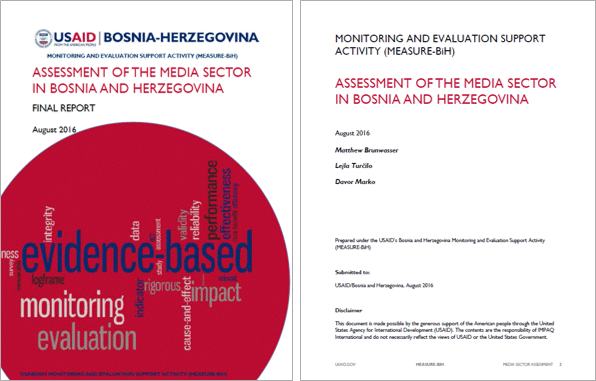 Media Sector Assessment was conducted by MEASURE-BiH with two main objectives. The first is to determine the precise state of reforms and needs in the media sector in Bosnia and Herzegovina (BiH). USAID/BiH needed an updated and precise assessment of the current media landscape in BiH in light of the media sector’s many significant needs, and the shifting international donor environment. The second objective is to identify the needs of BiH media sector that can be most effectively met by USAID assistance and to make specific recommendations for potential future involvement. In this assessment, the team also incorporates the lessons learned from USAID's most recent media assistance in BiH - the five-year Strengthening Independent Media (SIM) activity that ended in 2015. What areas of the BiH media sector require the most urgent assistance that can be provided in the next five years? What types of assistance might be the most effective in those areas, and on what scale? What are the comparative advantages of US assistance to media outlets? We combined qualitative and quantitative methods to collect and analyze data. Methods include conducting semi-structured interviews with 50 Key Informants (KIs) in Sarajevo, Banja Luka and Mostar as primary sources and analyzing key legal documents and reports on the state of the media sector in BiH. Based on research findings, the team systematized findings around four main problems related to the BiH media sector, and devised two recommendations for potential immediate USAID intervention in media sector in BiH.